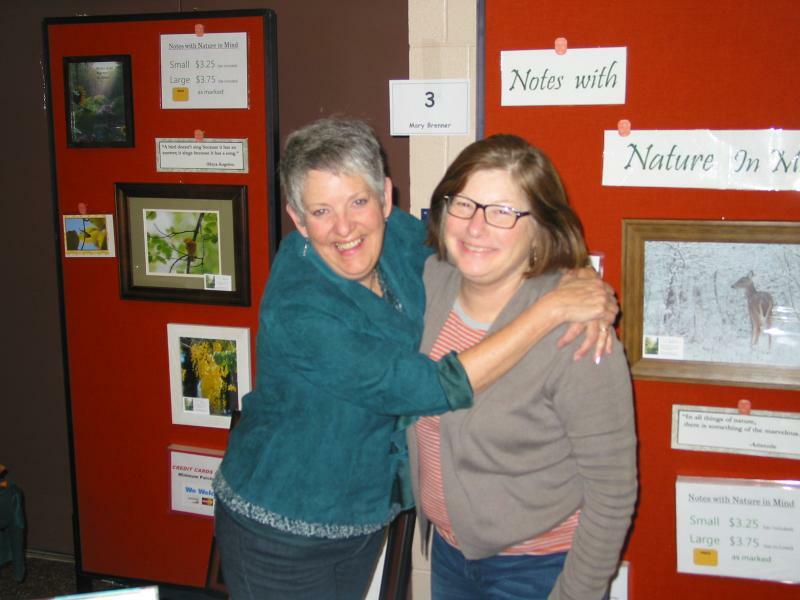 Mary and Linda have been friends for 30 years, beginning when they were teachers together. Mary has been taking wildlife photographs for her entire life, from her backyard on Blue Mountain, Pennsylvania, where she watches the annual hawk migration, to Baraboo, Wisconsin, where she saw her first whooping crane. Mary’s love for birds and nature photography has taken her all over the United States and beyond. She uses a Nikon D7000, usually with a 300mm lens, and prints of her photographs are also for sale. Linda is a lifetime crafter who first discovered she had an eye for color coordination when selecting matting for framed art. She first put her crafting skills to use when she was introduced to the art of scrapbooking, and she has been making beautiful creations ever since. Linda enjoys singing and baking, and two of her favorite things in life are cheesecake and Paul McCartney. Mary with her camera, and Linda working a craft show. For more information and for orders, contact Mary and Linda at noteswithnature [at] gmail.com. I love your cards! How can I purchase more? Thank you for visiting our site, and we love that you love our cards! We just launched an Etsy site http://www.etsy.com/shop/Noteswithnature which is a work in progress, but we have several cards for sale there currently. You can also email us directly at noteswithnature [at] gmail.com and we’ll be happy to work with you on whatever you’d like. They have already attracted many of our readers and are an inspiration. Will do! New photos on Facebook.